A festive way to get your kids to eat their sandwich crust! 1. Assemble a sandwich using your 2 slices of whole wheat bread and sandwich filling of your choice – I used ham. Using a large circle cutter, or the open end of a drinking glass, cut your sandwich into a circle shape. Place this circle sandwich on a plate and save your crusts! 2. Take your crusts and carefully cut the crust away from the remaining bread, if there is any. We’re going to use the crusts to make the reindeer’s antlers. You’ll need 2 larger pieces and 8 smaller pieces. Cut your crusts into these pieces and then place them on your plate for the antlers. 3. Cut your cherry tomato in half and place one half on your sandwich, cut side down, for the nose. 4. Grab your slice ofmozzarella cheese and cut out 2 small circles. You can use a small circle cutter if you have one, otherwise your knife will work fine. Place these circles on your sandwich for the eyes. 5. Grab your 2 black olives and cut them in half. Place one half on each of the mozza cheese circles to finish off the eyes. 6. Finally, grab your olive scraps and cut one slice off the olive. Then cut that slice in half to make a smile. Place this smile on your reindeer sandwich. 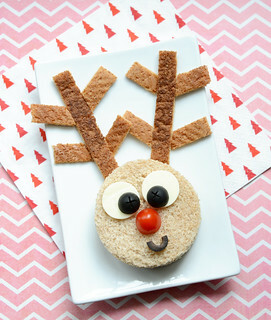 Rudolph looks so cute, your kids are sure to love him! It’s so fun making your kids a fun lunch this time of year. Give it a try, I bet they’ll love it! Enjoy!